Segua Kingdom has been losing the war against Ninterdo Empire but the tables are turned by the appearance of a boy called Gear (a parody of Sonic the Hedgehog). All the characters are parodies of Nintendo or Sega games such as Sonic the Hedgehog, Super Mario Bros., The Legend of Zelda etc. 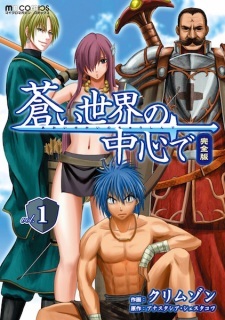 Aoi Sekai no Chuushin de has been published in English as World War Blue by Seven Seas Entertainment since July 2, 2013.